In Europe, Mission critical applications are catalysed by digital technology rise and are now developing rapidly. Smart grids for distributed Energy, safety beaconing for smart highways, automatic (driverless) train control, sensor & actuator networks for water management are three representative sectors of applications. They require more and more data flowing across wide geographic areas, and are expecting efficient wired and wireless communications. Critical softwares and algorithms are supported and must be sustained for a long lifetime. Security is needed from end to end. The assurance of working utilities, the availability of operating transport systems, and the warranty of a good quality of water are essential for modern European society. Such purposes cannot be reached without radio networks and increasingly wireless broadband support. Traditionally, each sector has had its own dedicated networks, often with exclusive spectrum allocations. The goal of the state of the Art is not encompass all existing and past technologies in the field of telecommunications. Only technologies of the three sectors that can be directly replaced by the LTE set of standards and its evolution must be considered, i.e. mainly capillaries between the core network and distributed terminals (UE with LTE). Classical terrestrial networks are composed of a transit core network as a fixed backbone, and of a set of capillaries to connect the terminals. The main standards and their historical evolutions are presented in Figure 1. The upper part shows the evolution of transit networks from “PTT” synchronous infrastructures to asynchronous full IPv6 switched infrastructures. Now, such infrastructures are based on meshed or redunded fiber optics (mainly) and microwave LOS links (scarcely). They are outside the scope of the study. 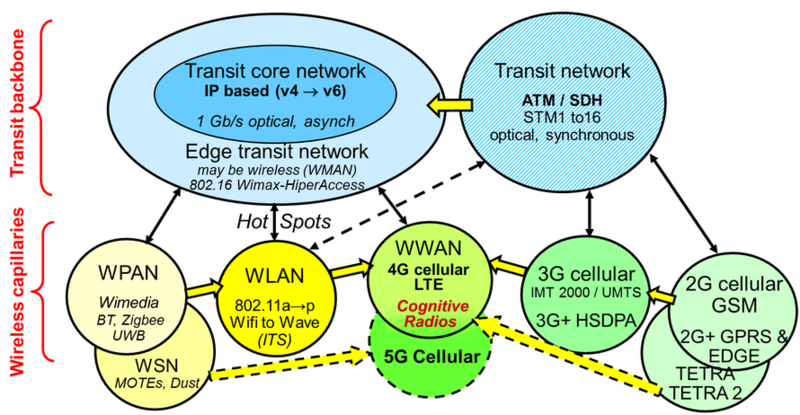 The lower part shows the convergence of wireless distributing networks between 2 slopes: WxAN and cellular radiophone technologies, following international standards (ISO, ITU, 3GPP, ETSI, CEN, IEEE). Such wireless networks are the target of the study. In some cases, they have replaced previous wired technologies based on proprietary products or de-facto standards. Some wired old technologies could be described as far as they explain the present state of the Art in wireless technologies.